The bar at Separatist South Philly. Separatist Beer Project, the Easton-based brewery that started as a gypsy wholesaler and canner using other company’s equipment, has come to Philadelphia to open its second tasting room. It’s on the ground floor of a new building at 1646 S. 12th St., at the corner of 12th and Morris Streets, just steps off East Passyunk Avenue. In a previous life before its move, Artisan Boulanger had the location. Separatist South Philly’s opening will be 4 p.m. April 11. Owner Joe Fay pours a cream ale at Separatist South Philly at 12th and Morris Streets. Fay and his wife, Laura, have set up a wide-open room with a 15-seat bar and mod-meets-retro seating for 70 people, inside and out; high windows open up to Morris Street. 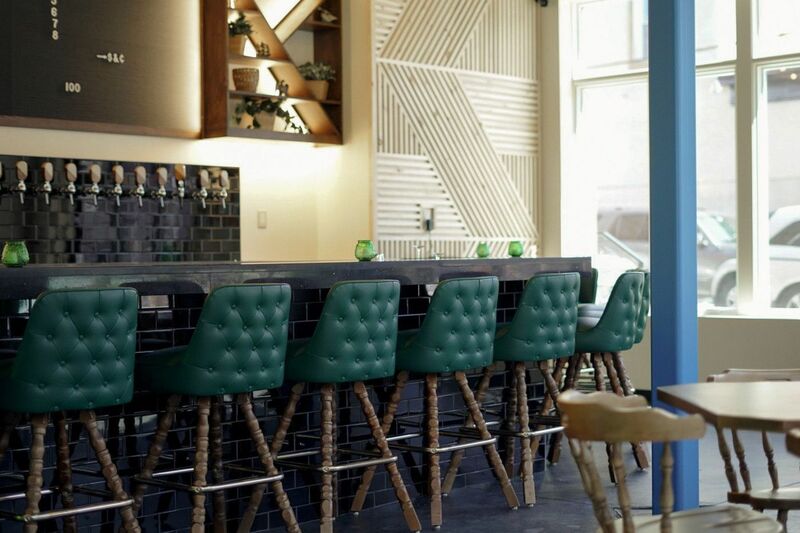 Separatist offers 16 taps — 12 of its own, plus 2 draft cocktails and 2 draft wines. There also is an extensive bottle selection of beers coming from Separatist’s blendery space in Easton that are refermented and conditioned in champagne bottles; they are available to be uncorked and poured right at the bar. “The other two brewers and I just really love to explore everything beer has to offer and then offer that snapshot here," Fay said. “Everything from the $4 frosted mug of American cream ale all the way to the three-year, barrel-fermented, cab sauv, musked, French oak, champagne bottle beer, which we have, too." Separatist South Philly is a tasting room offshoot of the popular Easton, Pa., brewery. Separatist was known as Sole Artisan Ales before rebranding last year. But ale, of course, was not what Separatist was about. “A separatist,” Fay explained, “is anybody that does not follow the status quo, and the status quo is something that is evolving rapidly in beer. When I got into beer almost 11 years ago [he was brewing as a teen], we were rallying against big beer and macro lagers and cheap ingredients, and really not having a wide variety of offerings." Separatist South Philly, a tasting room, occupies the ground floor of a new building at 12th and Morris Streets, just off East Passyunk Avenue. Hours: 4 to 11 p.m. Monday to Thursday, 4 p.m. to midnight Friday, noon to midnight Saturday, and noon to 8 p.m. Sunday. Separatist South Philly is a tasting room at 12th and Morris Streets.